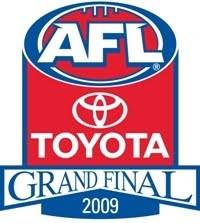 NRL Tips Round 26 2009 - AFL Tips Finals Week One 2009 - The Wallabies can't buy a win... =================================================================== So the Top 5 is outdated huh? A few weeks ago I had to endure Ray Warren wax lyrical about the virtues of 'the top 8 system' and how all the opponents to the setup should eat humble pie etc etc. He was alluding to the fact his beloved Parramatta Eels were winning their way back into Finals contention and without a Top 8 - they wouldn't have had the desire to put up such a fight the last two months. But Warren is completely deluded if he thinks that because the NRL accepts eight teams in the Finals - Parramatta had reason to wake up and turn Jarryd Hayne loose. He made these comments during the Wests Tigers v Parramatta Eels game in Round 24. At that stage the table was as such that the difference between the 12th placed Rabbitohs (23 points) and the 5th placed Tigers (26 points) was just 3 points. Note the point totals of team four (Storm 29) and team five (Tigers 26) – there is still only 3 points separating them – meaning the Storm were anything but safe with three rounds to play. Just in case Rabbits was high on haemorrhoid cream - at the very moment he declared the Top 8 the best thing about the game, every one of the 12 teams still in contention for the Top 8 - were still in contention for the Top 5. In fact - fast forward to today and look at the table and just one team can make the Top 8 from outside it. Round 24 saw the Rabbitohs and Cowboys fall out of playoff reckoning and the Wests Tigers dropped out at the end of Round 25 (after being 5th after Round 23!). Now with just one round to go - instead of having 12 teams ready to go into 8 spots - we had just one extra team vying for survival. A tad deflating if you ask me… Now return back to before Round 24 and all the teams in contention for the Top 8 - were in contention for the Top 5. And if you look at the table heading into Round 26 - seven teams are still in the running for the five playoff spots. And two of those teams (Eels and Sea Eagles) would have to beat teams in the Top 3 to make the Finals. 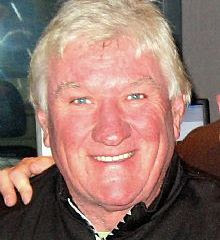 Ray Warren's beloved Parramatta still find themselves outside the hypothetical Top 5 on 29 points and would have to beat the #2 Dragons away from home to give themselves a chance to qualify, then rely on both the Sea Eagles and Broncos losing to the Titans and Raiders respectively to get in. Newcastle would only be a ridiculously long shot mathematically - needing to beat the Panthers by 60 odd points and rely on Manly, Brisbane and Parramatta all losing. But the Knights blew their chance against the lowly Raiders in Round 25 - and have only themselves to blame for the position they are in. Penrith would not be a hope of making the Top 5 - but need only a win over the Knights to make it. My point is this. The top 8 has forever rewarded average teams with mediocre seasons with a chance to fight for the premiership that the teams above them have earned the right to contest. As stated above - entering Round 24 - the same number of teams could have made a Top 5 Finals as the current Top 8 format and the truly deserving teams would have qualified for the games that truly matter. As it stands now - it looks like Brisbane, Parramatta, Newcastle and Penrith may all have a chance at the title when their seasons have been anything but stellar. In fact Melbourne and Manly are only sporting 13 wins from 23 games and while that would qualify them for the Top 5 - they look nothing like the teams that contested the Grand Final in 2008. Which would leave the Bulldogs, Dragons and Titans - teams who have won the vast majority of their games with the biggest advantage heading into the Finals. Which - since they finished in the Top 3 - is the way it should be. Now I'm not saying that those three teams are the only contenders for the Premiership - but they have earned the right through the minor premiership rounds to be in a position to contest it. Now they'll come under threat from hot teams who could very well beat them in Week One of the Finals - that's not unfair in the sense that you have to beat those teams in front of you to earn a premiership - but the Bulldogs, Dragons and Titans shouldn't have to play teams that have had ordinary seasons but a hot last six or seven weeks. Again that being said - this title race is wide open and the Top 8 allows 'hot' teams with ordinary seasons to fight for the premiership - but one can't help but wonder if letting teams wait until the final two months of the season to start playing well is a fair reflection of what the minor premiership rounds are actually about. Just a thought - I'm still looking forward to the Finals Series and if Parramatta qualify - Jarryd Hayne turning it on in the big game when it really matters - but I fail to see how forcing teams to qualify for a Top 5 is not more conducive to a better regular season competition than the structure the current one is played under now. Friday Night Football sees the Parramatta Eels on television once again - this time against the struggling Dragons and the Tigers at the SFS hosting the Bulldogs, to start Round 26 of the 2009 NRL Premiership begins. The first and second parts of our 2009 NRL Premiership Reflections Series are also available on this site and are well worth a read. AFL Finals Series Begins - full preview below. Essendon are your 8th Finals Team as Hawthorn complete their implosion in a forgettable year following their premiership heroics of 2008. St.Kilda took home the Minor Premiership with their first win in 3 weeks over the Demons and the Bulldogs slipped past the Magpies on percentage to take 3rd spot. For the Hawks, Swans, Demons, Kangaroos, Power, Tigers, Wharfies and Eagles - 2009 is now a bad memory. As for a tip? I believed at the start of the season that Geelong would make it three Grand Finals in as many years and win a second premiership in 2009... injuries and worrying recent losses make me more than a little concerned about their chances - but they remain my pick for the Flag. Not that you really care but the hit and giggle Twenty20 Games between Australia and England were basically rained out. Now we move onto the exceedingly long One Day Series and the absences of the Australian captain and coach for most of them. Australia are winless in the Tri-Nations - but remember: it really doesn't matter in the grand scheme of things. Sure we got dusted by the Springboks in Perth but until the games mean something (and we have a team that can actually beat SA or NZ) don't let the losses worry you. 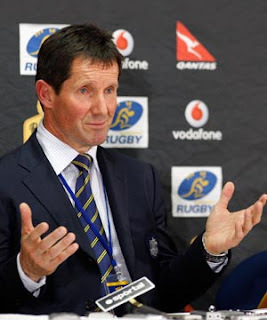 Australian coach Robbie Deans will be concerned that we can't win games like the one in Sydney two weeks ago but he's got a plan for 2011 - trust in that. Australia play the Springboks again this weekend in Brisbane on Saturday night. You can follow these sports and more, here on wdnicolson.blogspot.com or via my Twitter feed. Can you kick a goal from the sideline just 1.5 metres from the tryline - interested in giving it a go? Go to http://wdnicolson.blogspot.com/2009/05/kick-off-2009-are-you-up-to-challenge.html for more information on Kick-Off 2009! NRL & AFL Match Previews below. =================================================================== NRL ROUND 26 - 2009 Quick hit Previews for the Greatest Game of All. DRAGONS over EELS > Preview to come. BULLDOGS over TIGERS > PTC. STORM over WARRIORS > PTC. SEA EAGLES over TITANS > PTC. RABBITOHS over SHARKS > PTC. COWBOYS over ROOSTERS > PTC. PANTHERS over KNIGHTS > PTC. BRONCOS over RAIDERS > PTC. =================================================================== AFL FINALS WEEK ONE - 2009 The AFL Ladder finished looking this way: 1. SAINTS 2. CATS 3. BULLDOGS 4. MAGPIES 5. CROWS 6. LIONS 7. BLUES 8. BOMBERS ============ 9. HAWKS 10. POWER 11. EAGLES 12. SWANS 13. KANGAROOS 14. WHARFIES 15. TIGERS 16. DEMONS So the Matchups in Week One of the 2009 AFL Finals Series are: Friday Night @ AAMI Stadium, Adelaide #5 CROWS v #8 BOMBERS CROWS over BOMBERS Given Essendon's injuries and suspension list - anything other than a dominant Adelaide victory would be a monumental shock. The Bombers have done well to make it into September but the key troops missing will be too much to overcome - Crows by at least 6 goals. Saturday Afternoon @ MCG, Melbourne #2 CATS v #3 BULLDOGS CATS over BULLDOGS Geelong aren't healthy and the Bulldogs beat them just a few weeks ago... so the Dogs might be a punter's best friend this weekend if the Crows are way too short. Still I've seen Geelong come back in a few games in 2009 they had no right to win - and something inside tells me they will lift now knowing that this game gives their club an extra week off to rest people up. Cats to win by 2 goals. Saturday Night @ Gabba, Brisbane #6 LIONS v #7 BLUES BLUES over LIONS Carlton blew their chance to have a home final and now must emerge from the Gabbatoir to stay alive in the premiership race. Carlton have the feel of a side that might make a run all the way to a Preliminary Final if they can get past the Lions - and I'm tipping them to do so. Blues by 4 goals. Sunday Afternoon @ MCG, Melbourne #1 SAINTS v #4 MAGPIES SAINTS over MAGPIES I give the Magpies a massive chance in this game. The Saints have just one win in the past three weeks and the Magpies - despite relinquishing 3rd spot to the Dogs in the final term - are capable of pushing the premiership favourites for all four quarters. If St.Kilda's stars are healthy then I think they have too much quality to be denied a passage straight into the 1st Preliminary Final. St.Kilda by 3 goals. =================================================================== 2009 ASHES UPDATE Ashes lost... time for the One Day Series that is about another seven weeks long... get comfortable. Follow me on Twitter during the Day's Play. =================================================================== WALLABIES TEST SERIES WINTER 2009 I'll say it for the umpteenth time - 2009 is a wash year, means very little outside of more experience for the younger blokes in the team. What Australian Coach Robbie Deans must decide is whether or not to keep his veterans around for 2010 with a view towards the 2011 World Cup in New Zealand. Here is the Test Schedule for Winter 2009: June 6 Sydney 7:30pm (EST) Bundaberg Rum Series v Barbarians Won 55-7 June 13 Canberra 7.30pm (EST) Bundaberg Rum Series v Italy Won 31-8 June 20 Melbourne 8.00pm (EST) Bundaberg Rum Series v Italy Won 34-12 June 27 Sydney 8.00pm (EST) Bundaberg Rum Series v France Won 22-6 July 18 Auckland 5.35pm (EST) Tri-Nations v New Zealand Lost 22-16 August 8 Cape Town 11.00pm (EST) Tri-Nations v South Africa Loss 29-17 August 22 Sydney 8.05pm (EST) Tri-Nations v New Zealand Lost 19-18 August 29 Perth 8.05pm (EST) Tri-Nations v South Africa Lost 32-25 September 5 Brisbane 8.05pm (EST) Tri-Nations v South Africa September 19 Wellington 5.35pm (EST) Tri-Nations v New Zealand =================================================================== Good luck with your tips this weekend!